"Delicious and inexpensive, this is a breeze to whip up. You will love this sunny salad packed with seasonal tomatoes, basil, and garlic. An awesome take-along salad for work with some whole-grain pita wedges or a whole-grain bun, or a nice side for grilled chicken, pork, or fish! I heat the salad dressing (before adding the chopped garlic) in the microwave 30 seconds to ensure the honey incorporates." 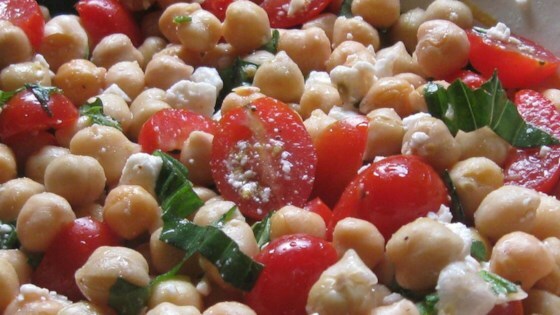 Toss chickpeas, tomatoes, feta cheese, and basil together in a large mixing bowl. Put honey in a small glass bowl; heat in microwave 30 seconds. Stir garlic, red wine vinegar, cider vinegar, olive oil, black pepper, cayenne pepper, and salt with the honey to make a dressing; pour over the chickpea salad and toss to coat. Cover the mixing bowl with plastic wrap. Refrigerate salad for 1 hour before serving. This was so delicious! I was worried it would be dry but it was great. My husband loved it, and it is definitely going in the rotation! It was delicious! My husband suggested using mint in place of the basil every now and then. This was a quick and easy side to make for husbands lunch for work and during the summer. I did add more of the tomatoes but other than that I found it to be fine as is. I doubled quantity of dressing and have to say.. absolutely yummy!!! Easy, healthy, and cheap. Next time I'd add bell peppers or onion for a little more flavor variety. Made this for 4th of July party was sooo good everyone loved it will make it again!